It’s hard to think about cool weather in the middle of August, but we have a money-saving tip that you should look into regardless of the time of year…. Do you use your boat in the winter? If not, there’s a good chance you can save a bundle of money on your boat insurance, especially if you’re boat is 26′ or more. We should also mention that we recommend getting an “All Risk” insurance policy on your boat, which gives you coverage against the widest possible range of potential losses. However, during the cold weather months when you’re not using your boat, the risk of damage or loss goes down significantly. That’s why many boat insurers offer lay-up insurance. then you should talk to your insurance provider to see if they offer a lay-up discount on your insurance. 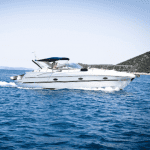 Your boat can be laid-up afloat or ashore, so dry or on-shore storage are not necessarily conditions you need to meet in order to get a lay-up insurance discount. Again, this insurance discount is more likely to be available for boaters in colder areas who own boats that are 26′ long or longer. Even if you live in a warm area and have a boat smaller than 26′, it certainly doesn’t hurt to put in a quick call or email to your insurance provider (or even a competing marine insurance company) to see if they can offer you a lay-up discount, especially if you meet the three conditions listed above. A lay-up discount could save you a lot of money every year that you own your boat, and there’s no sense paying for something that you don’t need or use. Previous: Are You Getting a Marine Fuel Tax Refund For Your Boat Fuel?